In 1900, the Canadian Pacific Railway (CPR) purchased 32 acres of undeveloped shoreline 65 kilometres north of Winnipeg on the southwestern shore of Lake Winnipeg and commenced construction of what would become one of western Canada's premiere resort facilities. In addition to the attraction of a three-kilometre stretch of sandy beach, the CPR also built and offered an array of accommodation, recreation, and amusement facilities. By 1910, between 12 to 15 trains were carrying over 40,000 passengers a day on holiday weekends to the popular resort. The romance of Winnipeg Beach began to wane during the 1950s and although the beach itself still remained a popular destination, in 1964 the amusement park was permanently closed. 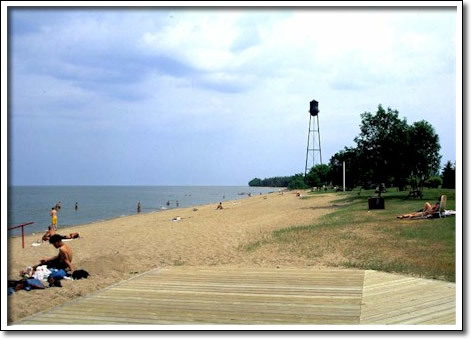 Of the many recreation and railway related structures erected by the CPR at Winnipeg Beach, only the steel water tower survives. It was designed and constructed in 1928 by the Vulcan Iron Works Ltd. of Winnipeg. Utilitarian in design and appearance, the 40-metre high tower supported a 90,000-litre capacity tank, and provided a source of pressurized water for the CPR steam locomotives, and fire protection services for the resort's facilities. Non-operational since the resort closed, the structure is the best example of only five surviving riveted-steel water towers in Manitoba. As in its heyday, the tower is a prominent visual landmark in and around the beach community.